Disclaimer: Please note that the purpose of this article is to share with you my experience in tackling the above. Not in anyway a guaranteed method. Blogger will not be held responsibile for any deaths in your tank, explosions that might occur or your parents/partner yelling due to the wet floor. Thank you. What is Ich or White Spots? It is a common parasite found on the body and fins of fish. It's white spots; hence the name. These white spots can caused problems for your fish such as breathing, loss of appetite, clamped fins etc. This is one of the most common parasite that any aquarists in his life might encounter. It will and can kill your fish. 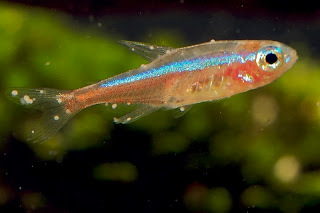 I had 1/5th of my fish population of tetra and harlequin wiped. Ichs has 3 life stages. When you see the spots on the fish, that is the trophont stage. It burrows underneath the fish mucus feeding on the fish fluids and hence you see the swelling which is the white spots. They feed for a few days and at the right temperature, the cyst drops off. This is the tormont. It swims in the water and attached itself to plants, substrate etc. Once attached to say plants, it multiplies like crazy. Once the cyst burst, it then swims out and search for a host. In this case, your fish. A stage where they swim in search of a host. They must find a host within a few days or so or they will die. This is where medication is effective. Kills these buggers. But once it finds a host, its back to Trophont stage. There seem to be no conclusive evidence of how the parasite have gotten into your tank. 2) You got a fish and did not check that they had this parasites in the trophont stage. 3) It is theorise that a fsh that once been attacked and survived the parasite, develops a stronger mucus. The parasite sticks and when it got introduce into your community tank, it unleash itself. 1) Check the fish you are buying. fish that weak are easy host for this parasites. 2) If you're the heavily worried kind, quarantine your fish for 14 days before introducing them to the community tank. 3) Buy plants in tanks without fish. Quarantine the plants for 7 days if you want. Or bathe them using potassium permanganate or bleach. But, despite all this, you still might get it. Don't panic. 1) Raise the temperature of your tank to 30DC...slowly. At higher temperature, you hasten their the parasite life cycle. You want to catch them when they a free swimming. I wouldn't go above 32DC though. 2) You can use salt (I'm not experience with this, please seek advice) or medication. Personally, I have use Sera Costapur. It will take about 10days and you will not see the spot. Personally, 3-4 days and mine were gone. But I did not stop the treatment for the next 10 days. Do not stop medication when you see there's no longer spots on your fish. The parasite might still be around in the water. Please read the medication instruction. I reduce the dosage a bit. Increase surface agitation. More oxygen the better. Watch your tank temperature and maintain it at 30DC. Always raise and lower temperature slowly. There is no need to do a water change during this treatment.